The holidays are a time for giving, and what better way to show your neighbors some festive cheer than with tasty Christmas treats from your kitchen. Whether you make everything yourself or spruce up something from the store, you can bring delight to your neighbors and give them something to enjoy for weeks leading up to and after the Christmas holiday. Are your neighbors dreaming of a white Christmas? Give them some white chocolate-covered pretzels for the holidays. Just melt gourmet white chocolate chips in a bowl, and dip the pretzels into the gooey mixture. Set them aside to harden, and then decorate the pretzels with colorful red and green edible glitter for more holiday fun. This quick video recipe on the Better Homes and Gardens website shows you how to create cute, edible snowmen from marshmallows, peanut butter cups, vanilla and chocolate cookies. Your neighbors will devour these tasty holiday treats while enjoying their adorable snowmen faces. Lemons for Lulu has a delicious holiday recipe for peppermint bark fudge on her blog. This treat combines the perfect blend of chocolate and peppermint to put your neighbors in the Christmas spirit. The final product fills an entire 8-by-8-inch baking pan and creates quite a few servings if you cut one-inch squares. If you've ever made Rice Krispies treats, you'll love this recipe on the Cookies and Cups blog. The secret is in the green food coloring that you add during the mixing process. Once you've baked the treats, stack them on a serving plate in the form of a Christmas tree. Add a few colorful M&M's here and there to serve as decorative ornaments. Kick off the holiday month with a bowl of snow-covered popcorn. Pop some plain popcorn, and pour it into a decorative red bowl. Melt and drizzle white chocolate over the popcorn, and top it off with some red and green M&M's. Cover the bowl in holiday plastic wrap, and present it as a gift to your neighbors. 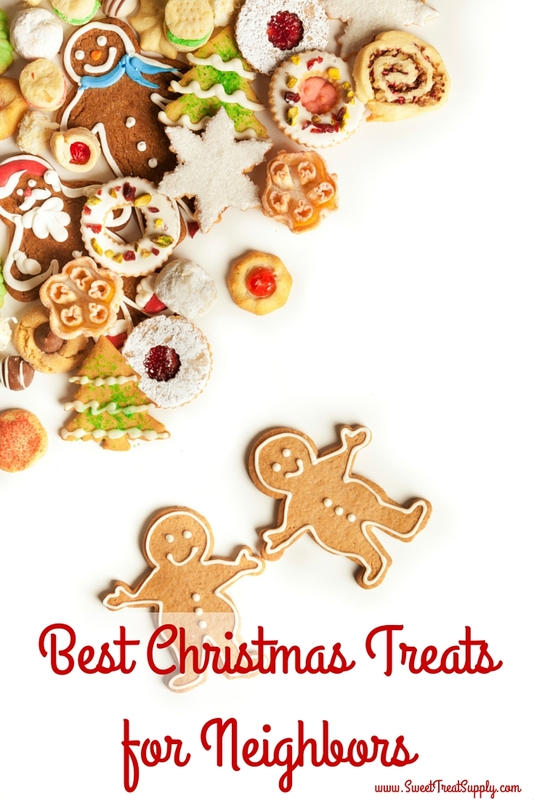 Want to discover even more desserts and gift ideas for your neighbors and loved ones? Leave us a comment below, and stop by our Facebook page to share your holiday creations!